Any Ideas for Dinner? : trains, planes, automobiles... and sausage?!? Note: This is a repost from the MattTheWebguy blog, and the post that inspired AnyIdeasForDinner.com. Hope you like it! There comes a time (almost) every afternoon that I ask my Sweetie these same four words... "Any ideas for dinner?" This roughly translates to "What would you like me to make tonight? ", since I do about 90-95% of the cooking in the house. Like most nights that aren't planned (we actually do plan a fair amount of dinners 'round here), I like the challenge of the Pantry Raid. I enjoy rifling through our pantry shelves, fridge and freezer, and seeing what I can create without too many special ingredients. I believe I do a fairly good job at working with what's on hand. Tonight's dinner kinda started with a special ingredient, (but it was gifted to us, so it doesn't count): three beautiful homegrown yellow tomatoes from my Mother's garden. The tomatoes, along with the request for a pasta toss type dish got me thinking.... and then the raid began. kosher salt and fresh ground black pepper to taste. And then "the pasta". We usually use Barilla Pasta Plus because it actually has flavor. Oh, and it's better for you than straight semolina pastas. But for tonight, we found some motorized vehicle shaped pasta we got for Christmas last year from my Sweetie's folks (CORRECTION: the pasta was a gift from my Sweetie's sister... thanks Sue!) 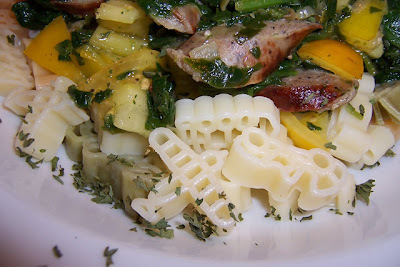 It was the perfect pasta for all of us to enjoy, even Boomper (aka Munchkin). He's not big on the dishes I come up with, but give him some pasta with butter and parmesan ("Shakey") cheese, and he's one happy little boy. 1. Cook the pasta (al dente) in a large pot of salted water. 2. Sweat the onion in the butter, olive oil, a sprinkle of kosher salt and a crank or two of fresh ground black pepper. As the onion just becomes translucent, add the garlic to brown slightly. 3. Add the sausage, and brown slightly. The grilling (broiling) adds some great flavor to the dish. 4. Add the spinach and combine. 5. Season to taste with the oregano, parsley, kosher salt and fresh ground black pepper. 6. Once it's all together and warmed through, cut the heat and toss in the tomatoes (so you don't bruise the fresh flavor). Give a quick toss and get ready to plate it up. 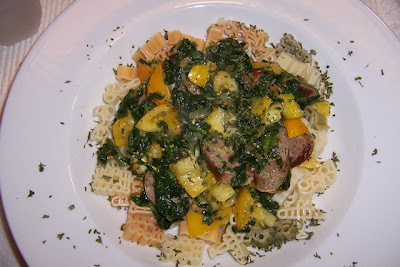 Plate up the drained pasta, spoon the sausage-tomato-spinach combination over the top, and finish it off with fresh grated parmesan. A chiffonade of fresh basil would have been killer, but our basil went to seed and is rather bitter now. And "yes", the parsley is for style points. Almost forgot.... I took a two-day old baguette, sliced it on the bias in 1/2" slices, spread them out on a baking sheet, brushed on some olive oil, sprinkled on fresh coarse ground black pepper and parmesan (some slice also received a slice of fresh tomato and more cheese and pepper, and then under the broiler it went for about two minutes. Nice addition to the meal. So... any ideas for dinner?